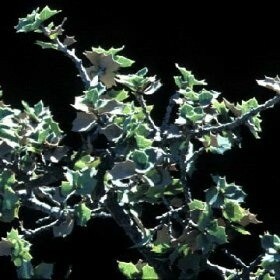 Hinckley's oak is a small, evergreen, multi-branched shrub which forms thickets about 4 feet tall. It has small waxy, gray-green leaves. The leaves are round or oval with wavy margins and coarse spiny teeth. Most of the known populations occur in Texas Parks and Wildlife's Big Bend Ranch State Park.